Most drivers and riders consider overtaking to be crossing to the 'wrong' side of the road to pass a vehicle in front. But, even if you do not cross to the 'wrong' side of the road, you are overtaking if you move into another lane or line of traffic either side of you to pass another vehicle. Even if you do not cross over to the 'wrong' side, there are some important safety rules you must follow. 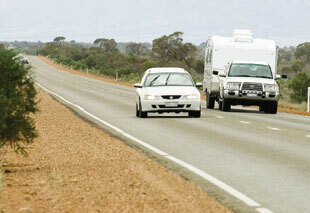 The rules for overtaking on a multi-lane or unlaned road are similar to those for a single-lane road. Remember, bicycle riders and motorcyclists are harder to see in traffic and do not have the same protection as drivers. When overtaking bicycle riders allow at least 1 metre clearance, or 1.5 metres when travelling over 60 km/h. signal your intention to overtake for long enough to give sufficient warning to all other road users. not obstruct the other vehicle. on any road where, owing to an intersection, overtaking cannot be completed safely. * Motor vehicles are allowed to cross centre dividing lines and straddle lanes in order to safely pass bicycle riders at the minimum distance but only if the driver has a clear view of any approaching traffic and it is safe to do so. 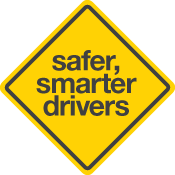 See examples 4A, 5A and 6A on the Driving on the road page. Bicycle riders can overtake another vehicle on the left, but not if it is indicating and turning left. not increase your speed until the other vehicle has completely overtaken your vehicle and returned to the lane or line of traffic. Except when overtaking, road trains must maintain at least 200 metres behind another long vehicle and if your vehicle is a long vehicle (7.5 metres or more including any trailer or caravan and any overhanging load), you must keep at least 60 metres distance between your vehicle and any other long vehicle. This does not apply to roads in a built-up area or multi-lane roads. Unsafe overtaking is something truck drivers see all too often. People can become impatient behind trucks on hills or when there are few passing opportunities. Some people take a very large risk for only a few seconds' gain. So allow plenty of room, pass quickly but safely and pull back in, only when you can see both headlights of the truck in your rear view mirror. This allows a safe space, but don't then slow down in front of the truck. What type of truck am I overtaking? How long will it take to overtake it? Can I see oncoming traffic? You have enough clear distance ahead, without oncoming traffic, dips or bends, to pass safely. It is also important to avoid being pressured into overtaking by other following vehicles. Keep your cool and if necessary let them pass. A driver of a car, travelling in a 110 km/h sign-posted speed limit zone, will take approximately 1 kilometre to safely overtake a 23 metre B-double truck that is travelling at 100km/h on a road with an overtaking lane. On a two-way road with a 110km/h speed limit, you will need almost two kilometres of clear road ahead to safely overtake a 23 metre B-double vehicle that is travelling at 100 km/h as you will have to allow for an oncoming car also travelling at 110 km/h. You should never overtake a heavy vehicle that is approaching a crossroad. Another vehicle, which is hidden by the truck, could enter the road from the left in front of the truck.